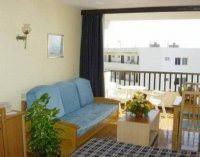 In a fantastic location, just a few hundred meters from the beach and resort centre but yet in a peaceful area. Bonanza an attractive destination for families and couples wishing to have local amenities within easy reach, such as restaurants, bars and shops accompanied by a tranquil environment. All units are south-facing and therefore benefit from maximum sunshine. Rooms: 139. Hotel Chain: Coral Hotels. 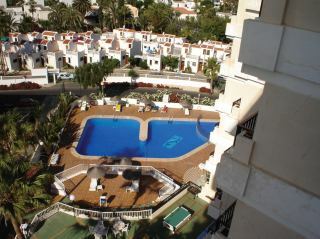 This charming complex is situated in a quiet location in the centre of Costa Adeje. The sprawling beach and the promenade with its many shopping and entertainment venues lie just a few minutes walk away. The bus station is at 100 m from the complex, and the Magma art & conventions just 50 m.
The welcoming rooms come with an en suite bathroom, a kitchenette, a fridge, a toaster, a kettle, a coffee pot, a telephone, a balcony and tv and a safe both for hite. Breakfast and dinner are buffet with show cooking, the complex offers use of a public Internet terminal. Regularly offered paellas and barbecues in the garden. 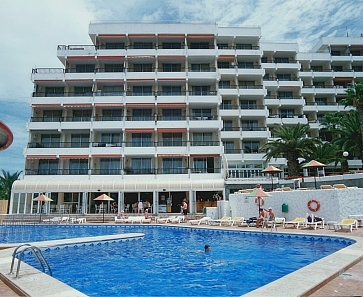 The complex offers use of a freshwater pool, with an area for kids, and a sun terrace with sunbeds and parasols. 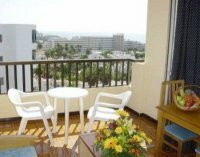 Guests can play beach volley, billiards and table tenis.